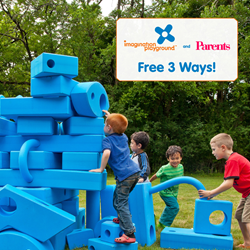 Free 3 Ways—Imagination Playground’s biggest and most exciting “creative play” giveaway ever—is officially underway. Conducted in partnership with Parents magazine, thousands of prizes (a total prize pool of over $1,000,000) will be awarded to participating parents. Imagination Playground is proud to now be partnering with Parents magazine. Parents magazine parents are deeply engaged with their children. Engaged parents know and love Imagination Playground. In addition, every parent that purchases with Imagination Playground this fall and winter will receive an annual subscription to Parents magazine. Parents wishing to claim gifts, enter to win, and review Imagination Playground’s fall specials, should visit http://www.imaginationplayground.com/FREE3WAYS. Parents, published monthly by Meredith Corporation, is America's #1 family magazine serving a powerful community of nearly 16 million readers. The brand is devoted to supporting the efforts of parents, educators and other citizens who strive to make the world a better place for our children. Imagination Playground creates innovative, modular building sets for indoor and outdoor play spaces. The recently launched Connectors set allows children to create advanced, moveable constructions, such as robots, vehicles, insects, characters, and costumes. Connectors can be used stand-alone, or integrated with Imagination Playground’s well-known Big Blue Blocks.